Absolutely perfect to personalize with names and stones of your family, this 3-stone personalized family gemstone ring with names from Apples of Gold Jewelry in 14K white gold is simply beautiful! The deign of the ring, which starts off as a slim band in the back with an almost wrap around design in the front with an additional piece on top, makes this ring very special. 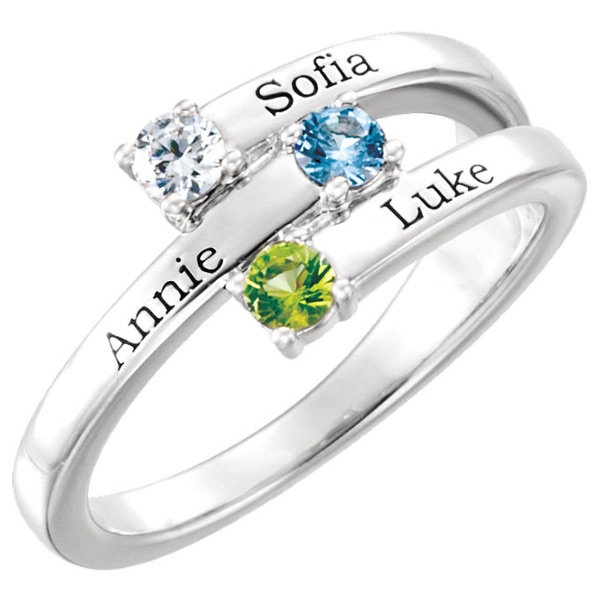 On each of the "bands" you have the option to personalize with a diamond, gemstone, and a name, up to 8 characters each. You can choose your own gemstones, which measure 3mm in size with an AA quality rating (or A rated for Alexandrite, Aquamarine, Emerald, Ruby, or Sapphire), or a 0.10 carat diamond, which is rated G-H for color and I1 for clarity. The weight of the ring is 3.55 grams, and the style is beyond gorgeous. If you wish to personalize this ring even further, you have the option to engrave the inside also with up to 13 characters (including spaces), and make it even more special. The ring weighs approx. 4.84 grams of 14k solid white gold! We guarantee our 3-Stone Personalized Family Gemstone Ring with Names, 14K White Gold to be high quality, authentic jewelry, as described above.